Anytime there's a chance of snow, people go nuts to get to the grocery store for two items: bread, and milk. I'm not sure why this is. If any hazardous weather is going to leave you in your home with no way of getting anywhere (or if you can trek the dangerous roads, it doesn't matter since most stores are going to be closed), I can name about several dozen other things you're going to need besides bread and milk, and that's including other types of foods and liquids. I call this type of temporary pre-snow insanity "Bread & Milk Hysteria". Or "Bread & Milk Stupidity". It doesn't always have to pertain to the panic to get bread and/or milk, just the panic before the first flake falls. And when there's panic, people do some really stupid things. Last night, my wife and I went to the grocery store, which is easily walking distance from our house. We knew the store would be packed, but snow or not, we needed to get some groceries anyway (Yes, milk was on our list, and a lot of other things were too, none of which happened to be bread.) We treated this like any other grocery trip; coupons ready, discounts from the grocery store's app on my wife's phone transferred to our frequent customer account, me wearing pants. Pretty much the norm. 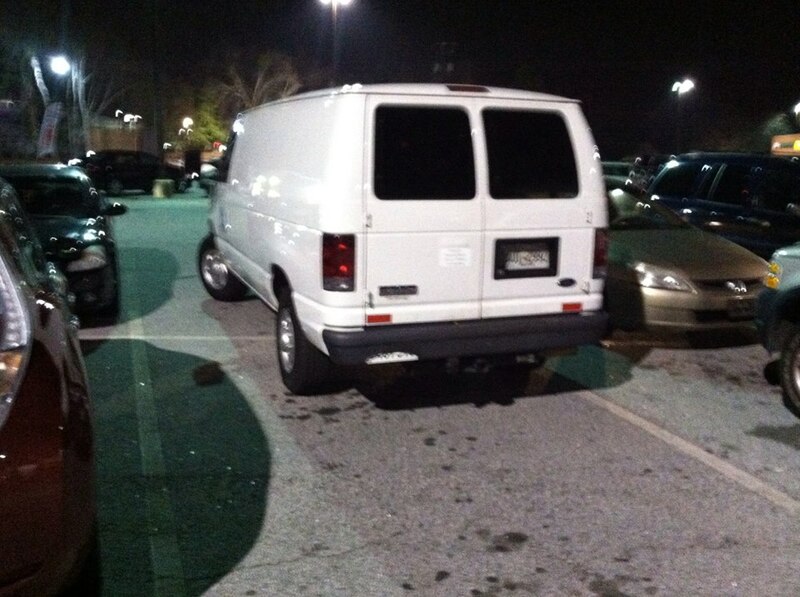 That's FOUR parking spaces this van is in... two of which were already occupied. 1. The driver is an incredible douchebag. 2. The driver is a teenager learning to drive in a vehicle too big for him to handle. 3. I still think the driver is an incredible douchebag. 4. "Bread & Milk Hysteria". The driver was in such a rush to get his bread and milk, "Bread & Milk Stupidity" took over and, BAM, driver lost all sense of common courtesy AND sense just to hurry into the store before the snow that isn't supposed to fall until later TODAY hits. Strangely enough, or not, considering we're in a pretty nice area, while the store was packed, I didn't see one case of panic or chaos. Sure, carts were bumped, but plenty of "Excuses me. "s, "Pardon me. "s, "Oh I'm so sorry! "s, and other civilized behavior continued throughout the trip. Anyone else experience any snow-related stupidity from folks? No, how Governor Deal DIDN'T deal last week's snow was handled doesn't count, I'm talking about regular folks. Tom Cruise: "DAVID! What does the SP Scouter Reading Say!?" Tom Cruise: "Is it over 9000?!" David Miscavige: "9000!? I WISHTH'! THISTH' MANIAC'STH IN THE OCTILLIONSTH'!! That can only mean he's a Super Suppressive!" Me: "You two midgets shut up before I hit you with my Karate Stick, I'M TRYING TO CODE AN ALGORITHM WITHIN A FUNCTION WITHIN A WHILE LOOP THAT PASSES FIVE INSANE FLOATING POINT PARAMETERS AND MY COMPILER HATES ME!!" Re: Polar Vortex 2014, and how it makes people stupid. Luckily I've avoided this craze. Went to the store pre-milk and bread hysteria. We're hunkered down for a few days. Cats are napping, listening to meditation music. Saw a few nicely sized flakes earlier - hoping the ice doesn't wreak havoc on the power lines. I picture your van driver in full milk & bread hysteria before parking. This weather is only going to last a few days. Couldn't a person live without milk for a couple of days? I guess snow is just such a novelty for us here in the South. Good to have you back around 88. Please do not buy from the scumbag about the Arnold loaf of bread in suwanee? Please check your local farmers and Latino markets. Also the freezer section for frozen bread, I'm sure your neighbor has a loaf in their freezer. The stores are making extra bread as well. Use liquid eggs if need be. That guy probably complained. Booo! Hey, maybe the seller was your van driver, 88! I heard someone got shot yesterday in a grocery store over a jug of milk! For all their 'OT' powers, I doubt they will be out in this stuff! Unless they have a spaceship to fly over the ice!